This book was so beautiful and yet at the same time painful that these two men had to hide that they loved each other because of people not understanding. So Renaldo’s father hires Henry to train Renaldo how to catch wild horses. Well Renaldo slowly starts falling for Hank while they are out searching for wild mustangs. The way these two MC’s were together was honestly beautiful. Their love for each other slowly grows the more time they spend with each other until it was time for Renaldo to go home that was when the fear of what they faced with Renaldo’s family started. They both decided that they would not lie to the family. I felt so bad for these two men I know back then in the Old West two men being together was not something many people would accept. But to have to hide your love and hope no one ever realizes that your are together it is really sad that things were that way back then. But their love was strong enough to show Renaldo’s family even with the fear of being cast out. I honestly loved the way the author wrote this story and these characters. I felt what these two MC’s felt, what they went through knowing that they might not be accepted. Really this book was just beautiful! I loved these two men together and how strong they were for each other. I also loved Renaldo’s family they were so loving and kind. Plus there was their first steamy scene together can I just say that was so damn hot!!! They had plenty more after too so don’t get me wrong lol. There was just something about their first time together that was just beautiful but at the same time very steamy. So I will leave this review with I honestly loved this book! I thought the way everything was portrayed for this time period was perfect. I would definitely 100% recommend this book! Born and raised in Texas, Laura Stone’s first novel, THE BONES OF YOU (Interlude Press), was a Foreward Review Book of the Year finalist and a Lambda Literary longlist entrant. 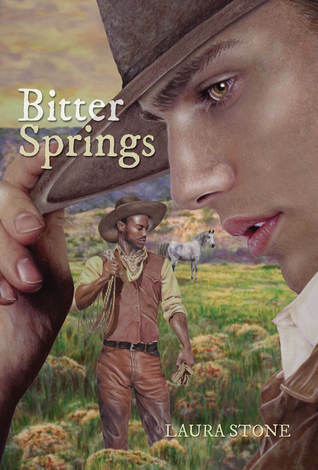 Her next, BITTER SPRINGS, is an historical LGBT novel set in 1870s’ West Texas, arrives Dec. 3, 2015. She lives in Texas as proof it isn’t completely populated by hard-line right wingers and because that’s where the good tamales are.